The historic plate that inspired this deck just proves it: skulls never go out of style. This design was taken from a historic plate in the Bicycle® Brand archives, then updated for the 21st century. The back design is black and silver, though we kept the standard four colors on the back of the deck. Perfect for pirates, villains, or anyone whose wardrobe is bursting with black. 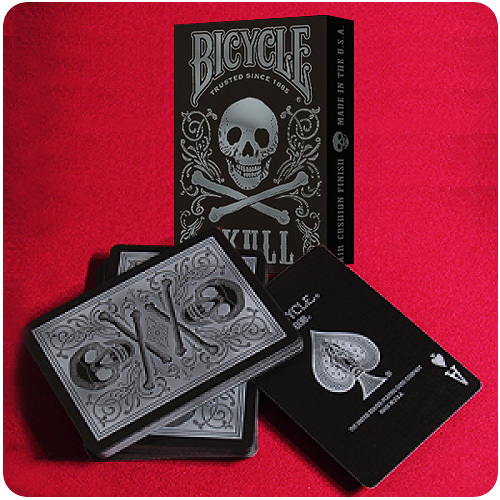 The Skull Deck features original artwork on the card back and the Ace of Spades. These decks were printed in the USA at the United States Playing Card Company and printed on premium stock with a quality finish. Αυτό το προϊόν προστέθηκε στον κατάλογό μας την Friday 20 March, 2015.